Christian University Nearly two hundred years ago the first group of American Protestant missionaries arrived in Thailand. They began their ministries by establishing educational and medical institutions for Siamese people in those days as expressions of their love, faith and hope in God. 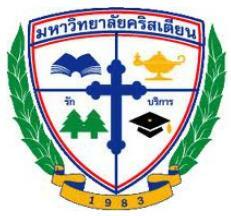 Christian University of Thailand is one of the prestigious institutions established by the Church of Christ in Thailand on September 7, 1983. The Ministry of University Affairs authorized Christian College to offer the first bachelor’s degree program in Nursing Science. The college was temporarily located on the 6th and 7th floors of the Dr. Dan Beech Bradley Building of Bangkok Christian Hospital in the heart of the financial district on Silom Road, Bangkok. In order to expand and become a full-fledged university, 176 rai (about 70 acres) of farmland was purchased near the village of Donyaihom 7 miles south of Nakhon Pathom, 31 miles west of Bangkok. Construction of 4 main buildings including a 5 storey dormitory began in 1994 and the college was relocated on the new campus in 1996. The college consisted of three faculties with the addition of programs in business administration and in arts and sciences. The programs were further expanded in 1998 with 4 two-year continuing bachelor degree programs and the first graduate school programs in management. Additional programs have been added through the intervening years, including an international Master of Arts in English as a Second Language program in 2003 and a Doctor of Philosophy degree in management in 2004. In recognition of the growth and stature of Christian College, on August 15, 2001 the Ministry of University Affairs re-chartered the status of the college to become the “Christian University” now officially named the Christian University of Thailand. H.R.H. the Crown Princess Sirindhon presided over the formal opening of the new campus and the unveiling of the nameplate on the main academic building named in her honor on June 6, 1997. Five years later H.R.H. the Crown Princess returned to preside over the formal unveiling of the new “Christian University” sign, and dedicated an arboretum in her honor, on June 28, 2002. Every year H.R.H. Princess Somsawaly presides at Christian University of Thailand’s commencement ceremony. These presence of members of the Thai Royal Family are a great honor for the university. Between 1996 and 2006 several additional buildings were completed including a multi-purpose recreation hall, a gymnasium, sports fields for track, football, tennis, basketball, petanque and volleyball, a second 5-storey dormitory, a food court and service buildings. The most recent building projects are the Nakhon Pathom Cultural Center, and the university’s Siam Complex Educational Center, in the center of Bangkok.